This salad is a magical combination of flavors and textures, "every bite is different" someone said recently when I made a triple batch for an impromptu family supper. It's a "concept" recipe for a mixed vegetable and fruit salad, just be sure to include plenty of fruit, that's what makes this salad special. 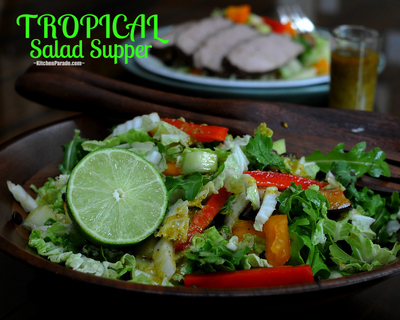 While the salad stands alone, it's especially designed to pair with Tropical Pork Tenderloin, just pork tenderloin seasoned with a distinctive rub and roasted. For a large gathering, I like to cook the pork ahead of time and chill, then slice it thin with an electric knife. Is it the same in towns and cities everywhere now’days? In my neighborhood, especially on the weekends, fathers push strollers as much as mothers. Weekdays, the Mom Parade starts about nine, mostly power-stroller-walking two and three abreast, faces taut and determined, filled with triple-tasking purpose: If we walk and talk fast enough for an hour, the baby will get out, our bellies will firm up, we’ll forget we’re sleep-deprived. Weekends, the dads some times line up in pairs and an occasional trio too. But their guffaws, their strides exude relaxed satisfaction, reminding passersby why strollers, indeed, are for strolling. How is it that a man is most masculine, most like a real guy’s guy and a real man’s man, when he’s parenting? I’m not sure except to be certain: Lucky kids. Lucky moms. And most especially, lucky lucky dads. SALAD In a large bowl, combine pepper and currants. (Stop here if prepping more than 30 minutes in advance.) Stir in cabbage, spinach, fruit and avocado. Toss with Lime Vinaigrette (you might not use it all). TO SERVE Arrange salad on serving plates. If you're serving meat too, arrange it on top of or beside the salad. Serve and enjoy! ALANNA's TIPS Observant cooks will notice less oil in Kitchen Parade salad dressings. It’s more healthful, of course, but also helps other flavors shine. Am I the last to discover Napa cabbage? It’s unlike waxy green and purple cabbages, more like lettuce with crunch. Its crinkly leaves chop up for salads or slaws or stir fries in no time. To prevent peeled bananas and avocados from browning as they will after a few minutes in open air, wet with a splash of citrus juice or drop briefly (no more than a couple of minutes) into what’s called "acidulated water", that's kitchen code for adding a tablespoon of lemon juice per cup of water. Lime Vinaigrette + Salad Per Serving (assumes 2T dressing, without/with avocado): 234/291 Calories; 7/12g Tot Fat; 1/2g Sat Fat; 0mg Cholesterol; 157/160mg Sodium; 44/46 g Carb; 7/10g Fiber; 32g Sugar; 4/5g Protein. WEIGHT WATCHERS POINTS Old Points 4/5 & PointsPlus 6/8 & SmartPoints 11/13 & Freestyle 6/8. CALORIE COUNTERS 100-calorie serving = omit the avocado, dress 1/9th of the salad with 1T Lime Vinaigrette. Mmm, that vinagrette sounds great. I love salads with fruit in them, they add a great flavor to plain old lettuce salads.